The average Facebook user has access to more than 100,000 photos. Who can recognize all those people? 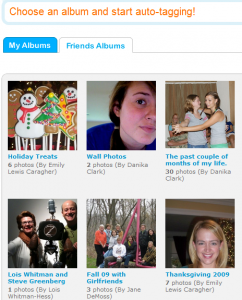 Face.com’s free Photo Tagger automatically tags friends’ photos, and notifies you when new ones are uploaded — even if they are not tagged. After you sign up, you get a nice photo album page with thumbnail pictures of all your friends, and links to their photo galleries. For people like us who usually forget to look at photos, this was a fast way to view the ones we most wanted to see.